Curtain Cleaning in Middlesbrough is a main part of our business as well as all the North East. We can even come to your home or office and take down your curtains, clean them and re-hang them for you. The dry cleaning of curtains is the most effective way to clean your curtains of accumulated dust, dirt and allergens.Our total curtain cleaning service to both private and commercial customers. Hotel; schools and colleges,stage and theatre, nursing homes; in fact all buildings to which members of the public have access, are required to have all soft furnishings flame retarded to British Standard. We can offer this service and issue a certificate of flame proofing. On-site cleaning is far less effective producing unsatisfactory results. We recommend dry cleaning your curtains at least every 3 years in order to extend the life of your curtains. Failure to regularly dry clean your curtains makes the removal of dirt more difficult and over time can damage the fabric. We can also dry clean and wet clean your nets, blinds, pelmets, swags and tails and tie backs. Our full service package provides a hassle free way of cleaning your curtains. Ideal Dry Cleaners collection and delivery service is FREE of charge*. Our specialist dry cleaning offer a collection and drop off service from as early as 9.00am, a convenient time for many of our customers. 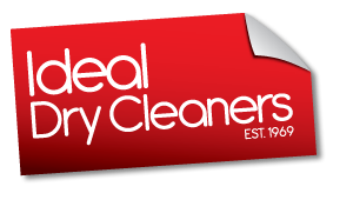 Ideal Dry Cleaners can collect from home or your work location.